I used to think this verse meant that when I was sad and sobbing, God would reach down and comfort my spirit. While I still believe this to be true, I think now that there may be a second meaning. Did you know that emotional tears contain different chemicals than regular tears do? Indeed, recent studies suggest that emotional tears may be the body’s way of ridding itself of toxic chemicals created by stress and emotional overload. 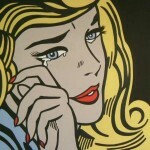 In fact, it appears that crying may be an key ingredient in maintaining both physical and emotional health. Rather than being embarrassed by our tears, perhaps we should welcome them gratefully as another facet of God’s gift of healing. Faith Reflection: Third Cross Down…and Goal to Go!